Posted by kewlhunter in Technology. The 924 was originally designed by Porsche to replace the 914 and 914/6, which was a joint venture from Porsche and VW, and sold under both brands badges. VW decided at the last minute to pull out and go with their own designed Golf. Porsche deccided to buy the rights from VW and still release the car as a Porsche. The 944 replaced the 924 and used an all Porsche designed 2.5 litre engibe, that was basically half of the engine used in the V8 928. By the time the 944 was made, even Porsche were promoting the fact it was actually a real Porsche, and in fact was equal with the 928, being the first real 100% Porsche designed car from go to whoa. The 944 Turbo came along and it was actually the first production Porsche to actually be born on the race track. Porsche built some hot 924’s that they took to Le Mans, and infact the cars were driven to the race track, one ended up 6th outright(winning it’s class too) and then driven back to the factory. This was where the 944 turbo was born. 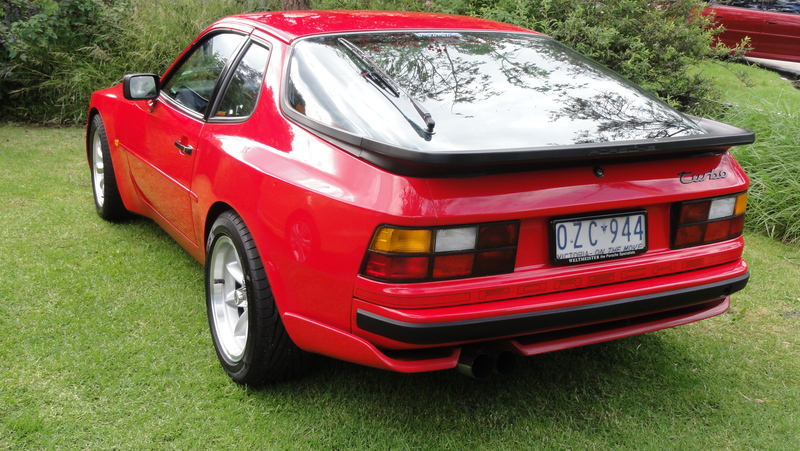 The engine was a turbo 2.5 4 cyclinder (although not indentical as was 16 valve), that elvolved into the 944 turbo engine. The suspension, balance, brakes etc all became what was basically was used in the 944 turbo production car. The turbo charger was the biggest Porsche had ever fitted to a production car. The car was legendary for it’s near perfect balance and handling, and was actually put down by pursits as being too easy to drive, as an OK driver could drive it very near it’s limits, unlike the 911 that was only able to be pushed near it’s limits by the very talented or the very brave…or very stupid but the stupid and brave often got bitten badly if their skill wasn’t up to the cars capabilities. The turbo 911 of the era was dubbed the widow maker for a very good reason. So we have this RWD, front engined, manual only, perfectly balanced car, with amazing handling, great brakes, incredible feel through the wheel and seats of the pants, car, that was shunned at the time, as it was perceived(wrongly IMO) as not being a real Porsche. Derek Bell who was one the drivers at Le Mans in the 924, still owns a version and has said many times it is one of the greatest handling cars of all time. Road and Track magazine in 1984 said the 944 was the greatest handling car in America available at the time, and voted it the 10 best handling cars of all time. Now as an owner of a 944 turbo I find it difficult to explain to anyone why the car is just the most amazing car to drive, as words will never do the sensations you feel justice. I drive many cars being in the car industry and to be honest no matter how good they are, they always just fall short of hat I get from my 944 turbo. Now roughly 30 years later Porsche answers it’s customers, who have been voicing their desire for a true sports car that was a manual, not a clutchless auto PDK like all their current GT offerings. The Porsche Cayman GT4 is born. It is only available only in manual, is mid-engined(for amazing balance), fitted with GT3 suspension, the old GT3 3.8 litre engine(a beast), and has been globaly praised as probably the greatest sports car available today. Not the fastest, the highest top speed, but the best. It can pushed very close to it’s limits by ordinary drivers, it is incredibly fun to drive at more realistic speeds for most owners, that many supercars fail at, because their limits are ridiculously high. Every bit of praise it gathers and every review I see, or read, I think wow that could have been said about the 944 turbo 30 years ago. So is the GT4 the true sucessor to the 944 turbo ??? Personally I think yes, and I also think that nothing inbetween these 2 cars(from Porsche) could be argued as coming close to what these cars bring to the table. Neither are 911’s and for some that is the only real Porsche which I understand, but I also think that it is their loss for havinga such a narrow minded view of what make a Porsche a Porsche. My car is amazing and brings something to my life that is impossible to explain, and I think the new Cayman GT4 does exactly the same to the lucky owners who have one. I would love to own both and maybe one day I will but if that never happens I won’t really care, as my 944 turbo gives me more than I could hope for. To me these are the Goldilocks cars, that are just right. Others will disagree and want to bring other cars into the mix but I have no interest in debating this and I am sure there are other great cars, but few could disagree(if they really know how good these cars are) that these 2 cars are something very secial indeed. The thing they share is what is lacking in so many other capable cars, and that is soul. This amazing bit of technology (the Navdy) looks like it really is bringing the future to our cars. The device allows you to do all sorts of things like texting, tweeting, make calls, see who is calling you, navigate, and much more, all while keeping your eyes on the road ahead. Pilots have been using this technology for years to make flying safer, and now it is coming to your car. The Navdy is a very clever device displays all sorts of information from your Android or Apple phone. It allows you to talk to it and use gestures to control it and will have a range of apps it can work with, all designed for use while driving. Because the display projects an image that looks like it is 2 mteres in front of you, that means you don’t have to adjust your focus to veiw it. The Navdy is available for pre-order at a significant saving over the normal price that people wil once it is released. You can pre-order by clicking here but don’t hesitate as this cheaper price is for a limited time. Well a few weeks ago I was trawling ebay when I decided to search for my favourite brand of kicks *FEIT*. Much to my surprise there were a couple of kicks for sale and amazingly they were in my size and very cheap. When I saw the listing I noticed they were unworn, and new with tags. I promptly ordered both styles. Now for those of you who don’t know the brand FEIT(pronounced fight), it was started back in 2005 by the Australian brothers Josh and Tull Price. Tull had earlier ha d a lot of success with a brand he started back in 1996 with a friend he went to school with Rodney Alder. That brand was Royal Elastics. They decided to replace laces with an elastic panel and by 2001 they were selling around 1 million kicks a year, in 35 countries. Although by any standards Royal Elastic was a massive success it didn’t represent what Tull was passionate about, and that was quality, craftsmanship, and sustainability. FEIT was born out of a desire to produce high quality shoes using traditional methods and high quality materials. This meant the shoes would be built to last, offer incredible comfort, and be an antidote to the mass-produced low quality shoes that have dominated the market for some time. Now I am old enough to remember my parents getting shoes re-soled at the local cobbler.